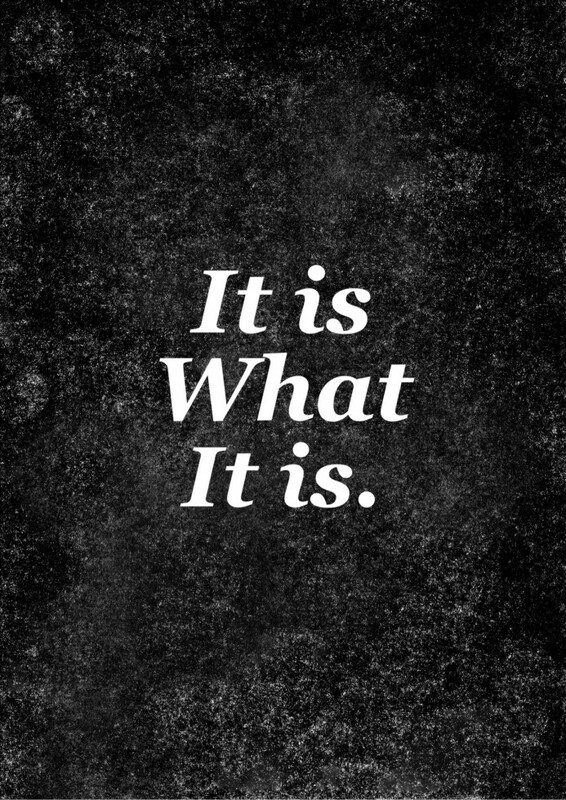 It is What It Is, Baby! I continue to be mystified by the addiction of the world at large of needing to categorize everything as “good or bad.” We spend more time than should ever be allowed on judging people, events, circumstances…even the weather…as good or bad. Living in the midwest has proven to be somewhat of an ordeal this winter (not that other places haven’t had their own ordeal with which to contend). Complaining about the weather is commonplace this winter. Winter is “bad”. Summer is “good”…unless of course it’s too hot and we forgot how “bad” the winter was and wish for it to be cold again. One restaurant is bad, another is good. One political party is bad, another is good. One country is bad, another is good. If you’ve been following my blog, you know I teach Nia. I end each of my Nia classes with “Gratitude in ALL things, no picking or choosing, and Let Love Command.” Every Nia class ends with these words. My life and how I live it is based on the four words, “Thankfulness in all things”. There’s just no sense in complaining about something over which we have no control. What if it were ALWAYS winter? Would life be one constant judgment of the weather being bad? How absurd. And my smoking’ gun is “thankfulness in all things.” Good, bad, who cares? It is what it is. I hosted and focused a “Life As Art” event on June 15th. Everyone from my Nia community along with a few local Nia teachers who have come to my classes were invited. Thirteen originally responded with a fourteenth student calling to say she was compelled to be at this event and would I still accept another participant — and of course I did!! We began at my Sacred Space Studio where we danced to an incredibly sweaty Beatles routine with the focus of Life As Art — the dance of creating patterns. There were 19 dancers — the studio was full of energy! The fourteen participants then met back at my house at 10:45, had some yogurt and fruit (readied by my wonderful husband), and gathered on our deck. I handed out the “welcome” packets that contained an journal, an envelope, 3 pieces of art paper, a gemstone, the 13 Nia White Belt principles with a specific “affirmation” respective of each, information about Zentangles, and a few select adages for the day (one on the dance of energy, one on Choices and one on leading a fascinating life. I directed everyone to look at the contents of their packet and then the contents of their envelope. The envelope contained one of three topics: Magic, Trust, or Surrender; 2 Zentangle squares, 2 body tattoos — everyone received “I AM” and then one other word (Passion, Breathe, Gratitude, etc. from Conscious Ink. Lastly (but not leastly) two letters of the alphabet. I had everyone look at which topic they had and invited them to find their other group members — there would be 3 groups of 5. The way they found their groups was to strike up a conversation using their specific word. For instance, one of the participants had the word “magic” and struck up a conversation with a group of 4 or 5 folks by saying “isn’t this property just magical” — 4 of the 5 people said “YES it is magical”. And thus the first group was formed. The second group formed quickly from someone speaking about “trusting that the weather would hold out”; and the third “surrendered to the anticipation of how the day would unfold.”. There was one group who only had 4 members — I became the 5th member of the group who only had 4 members. The participants were invited to take some time to walk the property. The weather was perfect (unlike the forecast which was for rain and storms all day); we have lots of areas to sit and meditate or take photos or simply to admire the beauty of nature. I walked up to the “ridge” where I could have an overview of our property. Different ones were walking together and looking at the flowers, plants, garden sculptures; others were sitting alone journaling, some were stopping to take photos. It was an incredibly rich panorama of spirited blessings. Truly magical. 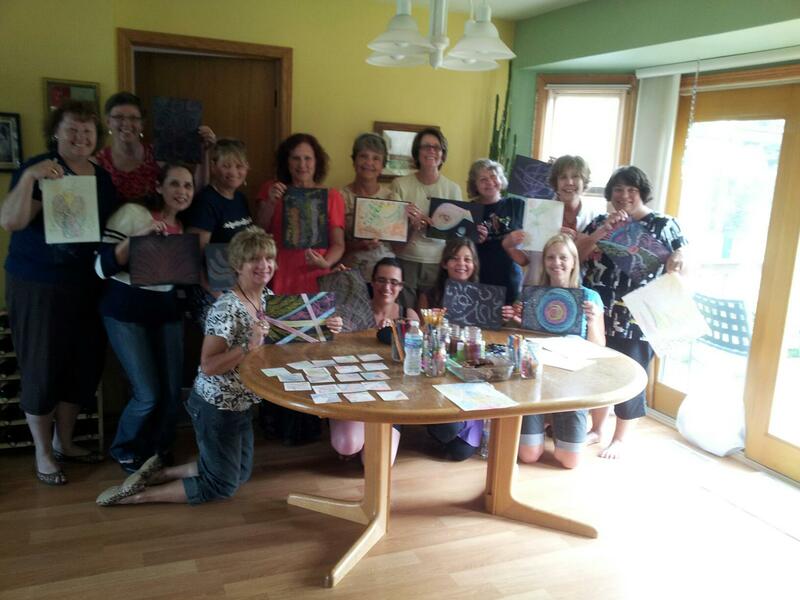 We all had lunch together (provided by Frank…the food was incredibly delicious), and then broke up into our individual groups with the assignments of creating Zentangles — one person started a pattern and passed it on to the next person in the group until all 5 participants had a chance to create a pattern (there were 2 Zentangles for each person within a group) — along with Zentangling the group was invited to create on one of the sheets of art paper (or all 3 if they wished) their own “dance of energy”. We came back together and shared our Zentangles and our artwork. Anita suggested that we share the vision for each of our “dances of energy”…which was an incredibly rich experience to listen to each person’s creative expression. Magical. We all sat together in our living room and shared why we thought we were in the particular group we were in — I suggested that it was not by accident and no coincidence that they were in their specific group. The trust and surrender from each person was indeed a magical experience. One person from each group read the related poem from that specific group (Magic, Trust or Surrender). Our closing ceremony was to take the 2 letters of the alphabet they had each received and make a statement, “Now I Am __________ ___________. There were 3 participants who only had 1 letter — those 3 participants got to choose any letter of the alphabet to go along with the one they received. A very creative experience indeed (especially around the Q, X and Z!!!!). After the event had completed, we sat around and sampled Frank’s wine and had gluten free chocolate chip cookies!! Not everyone was available to stay (or leave and come back) for dinner, so we all hugged and said our so-long, farewells. Several came back with a guest and we had a lovely dinner — again provided by Franko. The weather was PERFECT. The last person to leave was Catherine and as she drove off, the rain started to come down softly, only to turn into torrential rains and 60 mile and hour winds. It rained and stormed all night. Incredible experience. I am blessed, truly and magically blessed through trust and surrendering to living in the moment and allowing spirit to open the doors of creative expression. I am so thankful for everyone’s participation and we will do it again!!! This is about my encounter with fear and my gratitude for the gift of awareness. I have for many years touted the magic and wonders of alternative healing techniques, herbs, and nutrition. I have not gone to a regular medical doctor in over 7 years. I know my body. I trust that my body will let me know when something is not right. I live with the aches and pains of osteoarthritis in my hands and knees (and probably other areas of my body, although it seems to center in those two areas). I teach Nia. For those of you who are familiar with Nia, you already know the abundance of education — somatic and academic — available through Nia. I’ve been teaching for almost 12 years…I’m forever grateful for the amazing benefits of being in my body — the awareness of sensations, the clever imagery, the deep and cleansing feelings and emotions, the plethora of creative opportunities to express my unique spirit — all contained within one hour of a Nia class — and also in everyday living. So, with all of this, and more, to support my experience of being fully in my body, why is it that at the first sign of something unfamiliar in my body I sense, feel and imagine FEAR? Fear is not something I am opposed to or am devoid of…certainly not. But when it comes to my body, I’m pretty darned aware of what’s going on. I know when I eat wheat…my belly will bloat and I’ll be uncomfortable. I know when I eat sugar I can expect a rush followed by a distinctive low. I know if I attempt to maintain a Level 3 energy level for an entire Nia class, my body will let me know I’ve done too much. This past week, I came home Tuesday night after a great Nia class. There was nothing experienced out of the ordinary all day, nor anything out of the ordinary in my Nia class. Yet when I got home I noticed a severe pain in the index finger of my left hand. By morning my hand had swollen, in particular the first two fingers (my index or desire finger and my middle or balance/power finger — just an interesting sidenote). Not only swollen on the knuckles on the back of my hand, but on the pads of the palm of my hand around those two fingers. Not just swollen, but in SEVERE pain. On a scale of 1-10, the pain was a 10. I thought I had broken my finger(s) somehow. The pain radiated down my entire arm into my elbow. I was fine at work on Tuesday, fine during Nia, fine driving home. It was really a mystery. What to do? Let the mind games begin. Fear loves mind games. I have not taken antibiotics for a multitude of years. They destroy the good flora in the intestines. I grew up on antibiotics, being a pretty sick kid most of the time. I was done with that scene. Yet, when the doctor suggested antibiotics, I jumped at the opportunity. Fear said YES, you must. I took 2 doses of the antibiotics and my body said “NO, stay true to what you know”. That was the message. By Friday morning I was still in pain, the swelling had not diminished. I called my acupuncturist, not expecting to be able to be able to get in. She was leaving town later in the afternoon but she had an available appointment. No fear. I know acupuncture and how it works with my body. I trusted. An hour after the acupuncture, the swelling AND pain had diminished 50%. Shortly after the acupuncture appointment, the pain was SIGNIFICANTLY reduced. The swelling was down 75% but the end of Friday. I could freely move the joints in my last three fingers. The middle finger was moving quite a bit, still a little stiff in the index finger, but it no longer looked crooked, I could straighten it almost all the way out. Hallelujah. I want to also mention my husband’s relentless love and caring; the wonderful compassion and enfoldment of many of my Facebook and personal friends who offered many suggestions and Reiki/energy distance healing. Gratefulness to the Universe for reminding me to listen to the voice of my body. Today is Sunday and although there is a bit of a “pins and needles” feeling in my index finger occasionally, I can fully extend it and there is just a teeny bit of swelling on the “pad” on the palm of my hand beneath my index finger. The gift of Awareness. Listening. Being. Responding. Choosing Love, not fear. So what was it — the swelling and the pain? Who knows? Maybe it was a spider bite. Maybe it was gout. It’s a mystery. My mind wants to know EXACTLY what it was. Spirit says let it go. This morning, I’m drinking my Mayan Mojo (a coffee alternative), some Nettles tea, alot of water, taking my Celery Seed, my anti-inflammatory enzymes and my probiotic. My body thanks me. The Universe thanks me. And I am grateful.